On Sunday, Mar. 6, it was announced that beloved former First Lady Nancy Reagan had died at age 94. 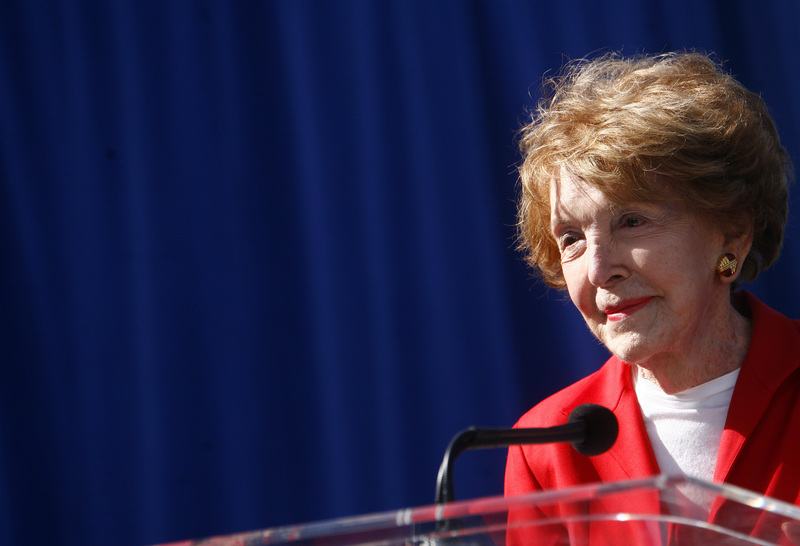 The wife of President Ronald Reagan, who reportedly passed away due to congestive heart failure, will be known for many things: her anti-drug campaign, her fight against breast cancer, her support for her husband, and more. Yet many might forget that before she took on the role of First Lady, Nancy Reagan started as an actor in Hollywood and even met husband Ronald while he was an actor, too. The Reagans were a couple with deep roots in Old Hollywood lore years before they'd establish their legacy as a prime political couple. According to Biography.com, the eventual First Lady was born in 1921 in New York City as Anne Frances Robbins, and was nicknamed Nancy. When her actor mother Edith married neurosurgeon Loyal Davis, Nancy took his last name as well, and this is the name she would become known for when she pursued her own acting career. After graduating Smith College with a degree in drama and English in 1943, she worked odd jobs and East Coast stock productions before making her debut on Broadway with a small role in Lute Song with Yul Brynner and Mary Martin on the Great White Way, according to Deadline. The stage show gave Nancy the opportunity to do her first Hollywood screen test, which led to her a seven-year deal with MGM Studios. Her first role under the deal was in the supporting role of Mariette Esmond in the 1949 movie The Doctor and the Girl (above), starring Glen Ford. She also played Helen Lee in the 1949 film East Side, West Side. According to Biography, she would eventually make 11 films, despite MGM seeming to typecasting her in "steady woman" or "loyal housewife" roles. Suddenly, however, Hollywood stopped calling, because Nancy landed on the McCarthy-era Hollywood blacklist of possible communist celebrities. When that occurred, she reached out to the Screen Actors Guild president — and future husband — Ronald Reagan for help. They met for dinner in 1951 and hit it off immediately, according to Variety. "I don't know if it was exactly love at first sight, but it was pretty close," the BBC quoted Nancy as saying. They married in 1952, with Ronald proposing to Nancy at dinner by reportedly saying, "Let's get married." Her response? "Let's," according to the BBC. Their daughter Patti was born later that year and Nancy took three more film roles, because "we needed the money," she said according to Variety. Together, she and Ronald both appeared in the 1957 film Hellcats of the Navy (above). After that, Nancy decided to dedicate herself to raising their children, and Ronald began his ascent to the White House. The Reagans would go from being a Hollywood golden couple to President and First Lady in 1981, and they stayed in the Oval Office until 1989. But, as you can see above, it all truly started in Hollywood.